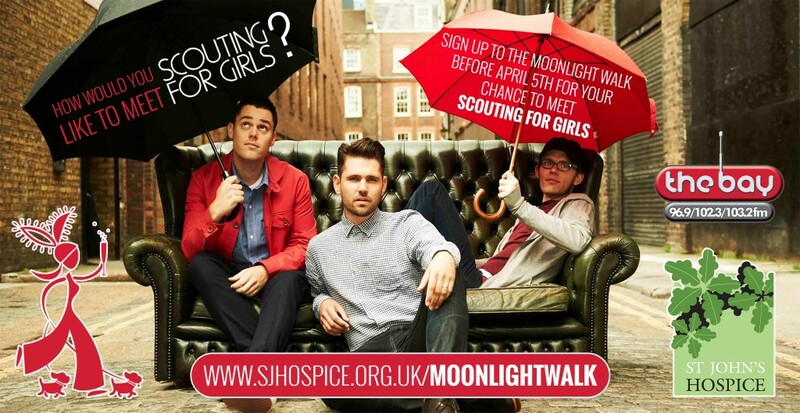 Home » About the hospice » Latest News » Fundraising News » Would you like to meet the band Scouting for Girls? Would you like to meet the band Scouting for Girls? All Moonlight Walk early birds entrants will be entered into a draw to win this fabulous, money cannot buy prize, thanks to The Bay! *This prize can only be taken on Sunday 1st May. If the winner and their named guest are not available on that day, or they wish to nominate someone to take the prize in their place, they may transfer the prize to two other people but they must notify St John’s Hospice by Friday 29th April before 5pm. This prize has no cash value and may not be sold to anyone else for profit. To qualify for entry to the competition, St John’s Hospice must have received your entry and payment to the 2016 Moonlight Walk before 11:59pm on Monday 4th April. The winner will be chosen at random from all qualifying entries on Tuesday 5th April and will be notified by phone. Good luck!